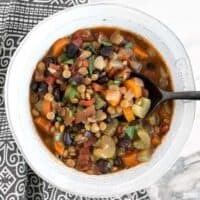 This Chunky Lentil and Vegetable Soup is packed with hearty flavor, texture, and good-for-you vegetables! Mince the garlic and dice the onion. Sauté both in a large pot with olive oil over medium heat until the onions are tender. Meanwhile, slice the celery and peel and slice the carrots. Add the celery and carrots to the pot and continue to sauté for about 5 minutes more. Drain the can of black beans and add it to the pot along with the diced tomatoes (with juices), dry lentils, cumin, oregano, smoked paprika, cayenne pepper, and some freshly cracked pepper (10-15 cranks of a pepper mill). Finally, add the vegetable broth, and stir to combine. Taste the soup and add salt as needed (I added 1/2 tsp). Serve hot. *I use Better Than Bouillon brand soup base to make my vegetable broth. It's less expensive than canned or boxed broths. **Brown lentils take about 20-30 minutes to cook, green or French lentils take closer to 45 minutes to cook.